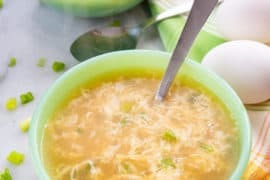 Making a vegan split pea soup is a pretty simple endeavor, you simply use olive oil to fry up your vegetables in and then use an all vegetable bouillon. The curry this time around came from me wanting something different on a cold June day. Yes, the weather here has really been cruddy for June. We had more of a heat wave in May here in Edmonton than in June. Boy, we are kinda getting screwed on the nice weather here, and it’s making me cranky. So a hot soup in the middle of June was in order. I am also desperately trying to clean out the pantry and the freezer this summer. 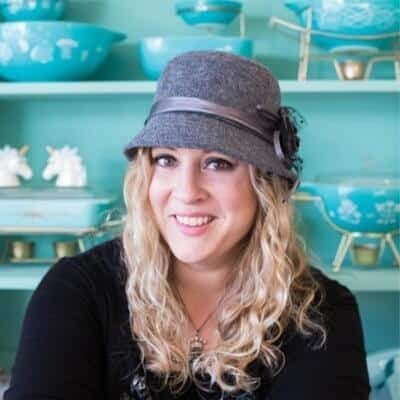 I am currently working on cookbook #2 and the recipe testing for that added to my busy season starts in September…well… I have no room. For anything. Come October I won’t be able to live in my own house due to mess and ingredients and bake goods. I found a bag of split peas and so it was lunch. One less thing in my pantry! Add the first 5 ingredients to a large stockpot and saute until the onions are tender. Add the curry and fry a bit more, then add the brown sugar and pour in the vegetable broth. Simmer on low for an hour or two until the peas are soft and dissolve. To make the croutons, toss the three ingredients together in a large bowl. Bake in a 350°F oven until brown and crispy. 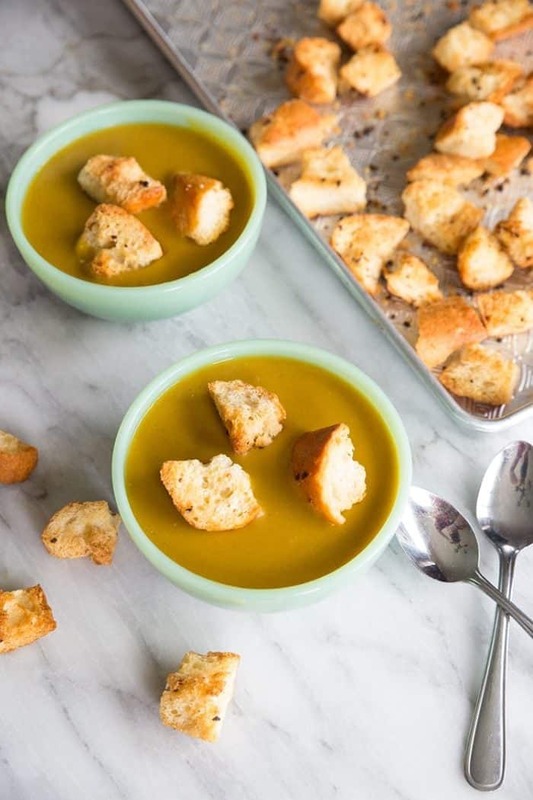 Once the soup is cooked, serve in bowls and top with those croutons! Happy cooking babes! How has your June been so far? 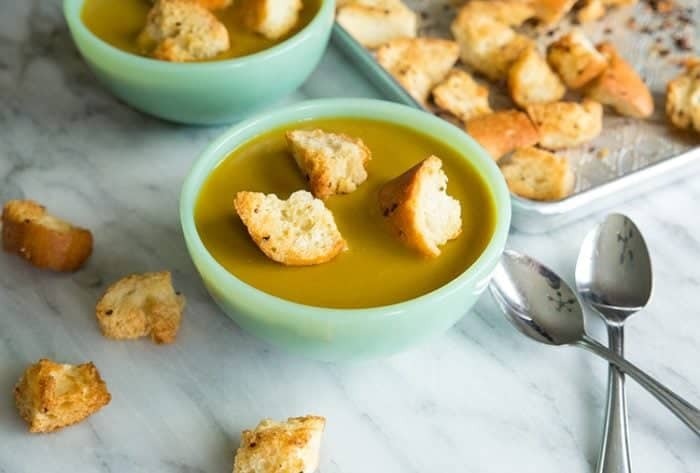 PIN THIS RECIPE to your SOUP RECIPES Boards and Remember to FOLLOW ME ON PINTEREST! 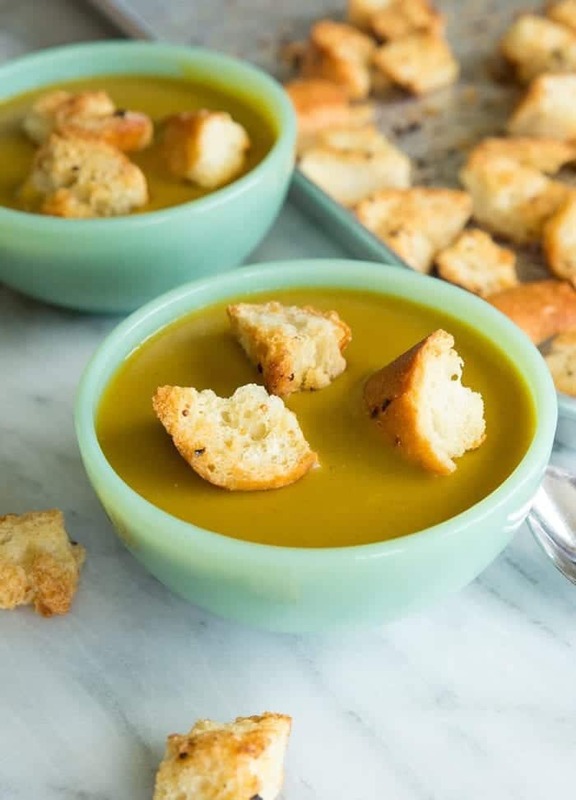 Vegan Curried Split Pea Soup with Homemade Garlic Croutons! This is sure to become a new family favourite! Add the first 5 ingredients to a large stockpot and sautee until the onions are tender. Simmer on low for an hour or two - this depends on how fast your peas dissolve and cook into the soup. Some peas have taken hours upon hours for me! Add sugar to taste. It helps balance out the curry nicely, which cream/milk (milk sugars!) usually does. 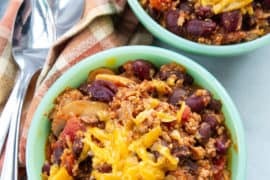 To make in a crock pot, follow the instructions then place everything in a slow cooker. Cook on low all day, then make the croutons when you are ready. I made the croutons with the half butter and honestly didn’t even need the soup after I ate them haha! 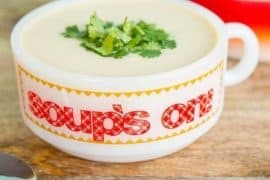 The soup was great but those croutons are amazing! Glad that you liked them so much! 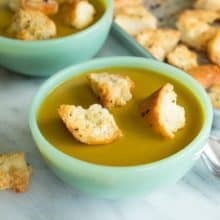 The croutons are a REALLY good addition to the soup!